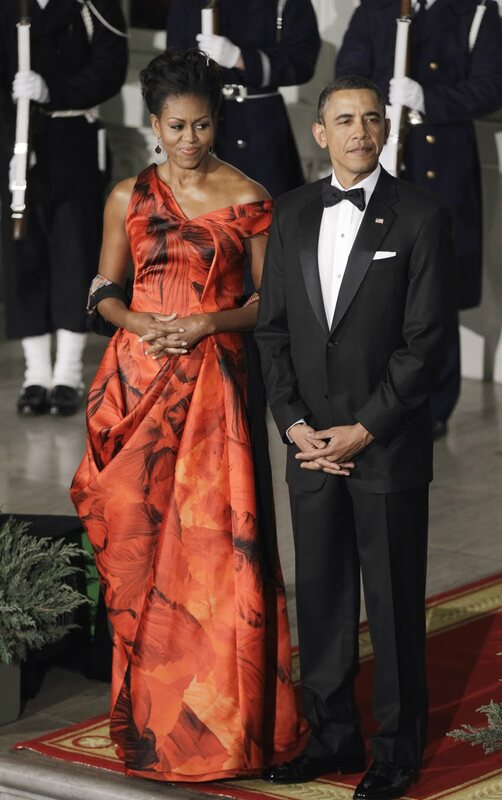 Did you love FLOTUS's dress for the White House State Dinner in honor of Chinese President Hu Jintao? FLOTUS is of course the First Lady of the United States Michelle Obama. I loved her stunning red and black gown by Alexander McQueen's Sarah Burton. Burton succeeded McQueen at his fashion house after the brilliant designer sadly committed suicide last February. Anyway, I loved Obama's whole look: the elegant updo, drop earrings and slightly off the shoulder petal print silk organza confection. It radiated elegance. It's so fun to follow the First Lady's style. She takes risks and clearly loves clothes. It's not even that she is the world's best dressed woman (although she's pretty up there). It's that she really enjoys mixing patterns, fabrics, and accessories and has a wonderful sense of what looks good on her. She always looks fresh, different, and unexpected. Some have said that Obama's choice in wearing red was seen as a recognition of the color's connection to Chinese culture. Red means happiness and prosperity and is traditionally what brides wear on their wedding day. Whatever the reason was, the woman looked breathtaking. One person who wasn't gushing over her dress? Iconic fashion designer Oscar de la Renta. The designer publicly criticized the First Lady's outfit telling Women's Wear Daily, "My understanding is that the visit was to promote American-Chinese trade — American products in China and Chinese products in America. Why do you wear European clothes?" Hmm… a bit bitter? Maybe not. Obama has actually worn two designs by de la Renta's son so I guess he really is just peeved. The designer noted that Obama is a major fashion get, with the influence and power to boost a house's business. "I'm not talking about my clothes, my business. I'm old, and I don't need it. But there are a lot of young people, very talented people here who do," he said. True, true but she's also allowed to choose an outfit based on how it looks on her, not on what it's global, national or diplomatic significance is. Cmon! Lighten up Oscar the Grouch! This isn't the first time de la Renta has criticized the First Lady's fashion choices. In April of 2009 he told reporters, "You don't go to Buckingham Palace in a sweater," referring to Obama's attire when she visited the Queen. There may be some truth in his statements but for now I'm going to keep enjoying FLOTUS's fabulous fashion sense and not think too hard about what it all means. 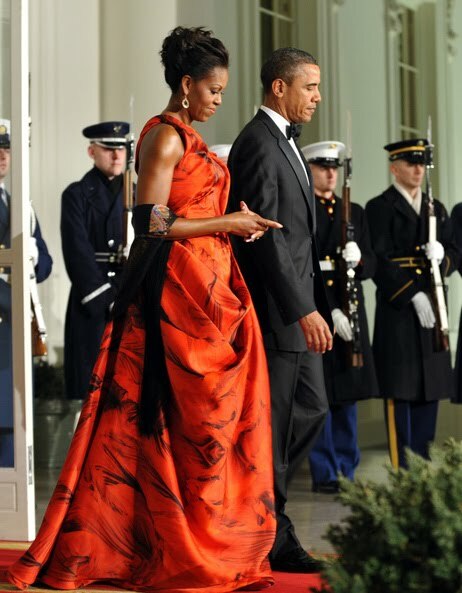 Check out Stylist.com's photo gallery on Michelle Obama's wardrobe. Thanks to NPR, Stylelist and Women's Wear Daily for info. Images from Getty. Why does he need to create a fuss about what the First Lady is wearing. I mean she has the right to choose the dress that she wants to wear. If she feels good in it then let her be. Thanks for the comment! Totally agree! People always want to pick on others, don't they!? She is stunning and so classy and regal. Let the woman be!